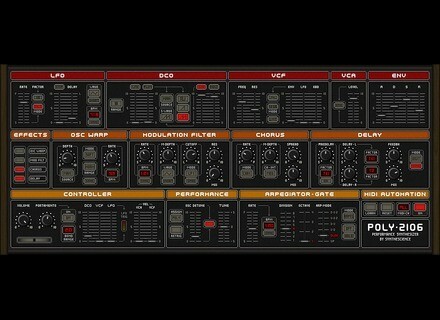 Poly 2106, Other Virtual Synth from Synthescience. 10 fingers won't be enough to download the 20 freeware plugins offered by Synthescience since this week. After releasing the two free synthesizers Poly 2016 and Podigious last year, Synthescience has unleashed no more that 18 effect and processing plugins, all free, but only as VST for Windows. You can now download phasers, flanger, chorus, autopan, slicer, ensembles like on vintage chord machines, equalizers, a filter, overdrives/distorsions, a Lo-Fi effect, a compressor, a limiter, and more. There are plugins for every task and every taste. Go to the Synthesizers section here to download the two synths and the Effects/Processors section for the rest, all on www.synthescience.com. [NAMM] Livid Instruments previews Base Livid Instruments posted on the internet a picture of their new controller named Base. Sonuus G2M guitar to MID converter iOS App Sonuus launches the G2M universal guitar to MIDI conversion app for the iPhone, iPod Touch and iPad. Massey Plugins launch a VST After offering their plugins for Pro Tools platforms only, Massey Plugins open to other DAW with the launching of their first VST.